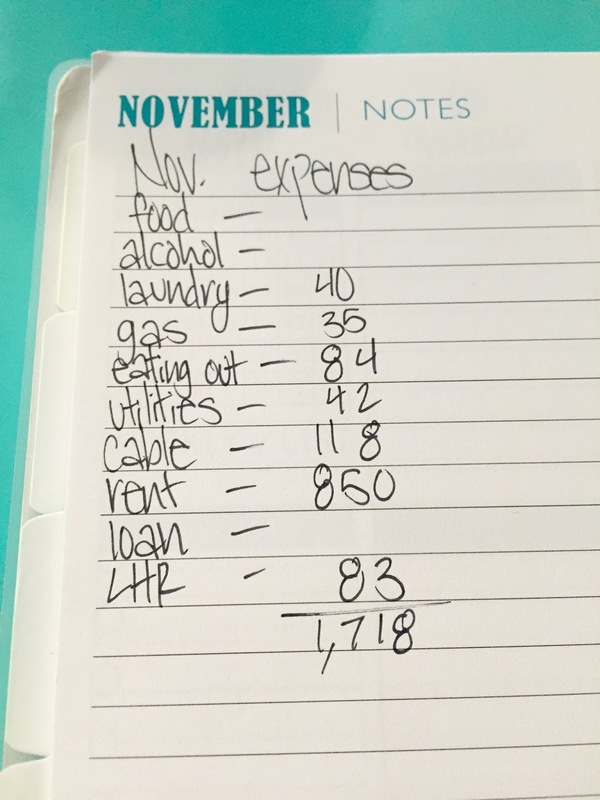 In the past year, I have dug myself exactly $47,476 in debt. Law school is fun! That comes from two loans, one FASFA and one from Sallie Mae. My FASFA (thankfully) only has a rate of like 1% but the Sallie one is a little steeper at 7% interest. Even though I've already been paying back my Sallie one a little bit each month, it's already accumulated close to to $400 in interest since August. And according to their website, I should be paying on this loan until 2028 so like, kill me. The nice thing about my Mint account though is that I can sync it with these loans and it will calculate how much I need to pay each month to pay it off faster (like when I have a big girl job). Read about my government loan here and read about my private loan here. As for next year, I read about how it's better to take out your loans semesterly instead of yearly, because there's a lower principal so you're accrued interest will be lower, so I'm considering maybe doing that if I can figure that out. I borrowed the full amount that my school suggested I would need because I didn't want to run out of money, but it turns out that I didn't need quite that much. The good news is that this is more than enough to cover my costs during the summer. I'm planning on doing the math and seeing if it'd be more beneficially to next semester take out a smaller loan and pay less on it now, or to continue taking out the max and paying a good chunk every month. It's a lot for me to figure out! One thing I did was I had my money deposited in my savings account instead of my checking account. I did this because 1. my savings account has a higher interest rate than my checking so I earn a little money each month and 2. because I know that if I check my account and see $4,000 in there, I will blow that all in a matter of weeks. Now, each month I move over $2,000 and don't let myself transfer any more unless it's necessary. If you do this though, I'd check with your bank to see if they have a limit or fees for transferring money between accounts. Mine does, but it's less than the interest my money earns in a savings account so for me it's worth the little fine. Before I came here I always had a part time job and a little help from my parents so I never had to budget, I just watched to make sure I never overdrafted. But now I've had to get smart about my money real fast. After I'd been in class for about a month, I looked up my bank statement and calculated where all of my money was going to. This was a big eye opener for me because spending $7 and $9 there seems like nothing at the time, but it really adds up over a month. That's how I somehow ended up spending $200 (!!!) just on fast food alone. 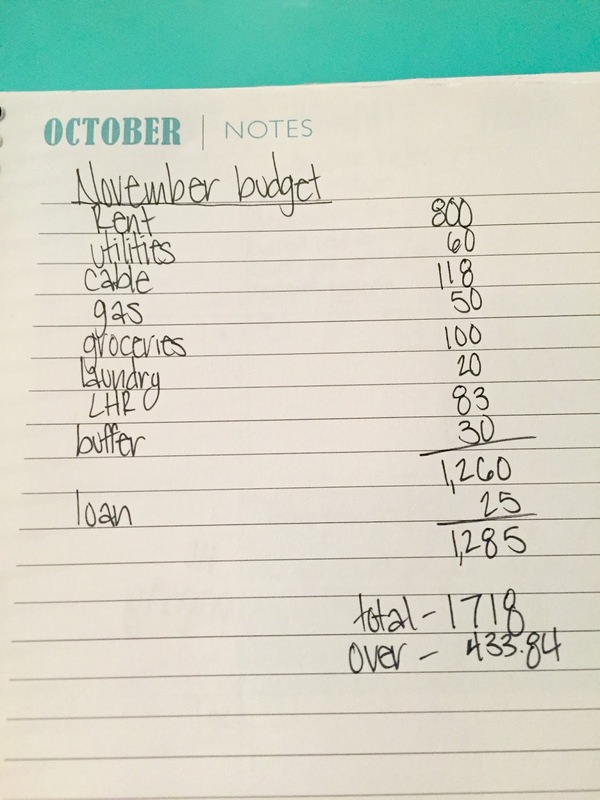 I used what I had spent in each category and created a budget. Then after November, I went back through and looked to see where my money had gone again. 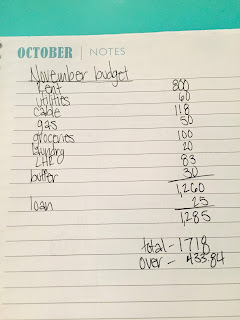 I went over what budgets I'd exceeded to see if they were because I hadn't budgeted enough initially (I thought I could go a whole month spending only $100 on food) and what I had just gone over because I wasn't paying attention ($60 just on getting my nails done). 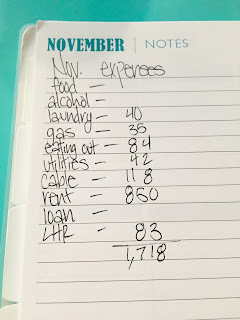 By comparing my two month's spending, I could see my spending trends enough to come up with a solid budget that I stick to now. A few things that've helped is that I've almost completely stopped eating out. I'm talking maybe 2-3 times a month. The good news is that I've lost some weight once I cut out all those Whataburger trips. I've also given up little luxuries, like now I only get my nails done for special occasions. Another thing I did was at the beginning of the semester I went to Costco and bought necessities in bulk—paper towels, laundry detergent, trash bags, shampoo... What I like about this is that now I don't have to spend money each month buying these. And recently I've started going to the grocery store in more frequent, but smaller trips because I realized that if I go once a month I get in stock up mode and just start throwing things in my cart that I don't actually need. For my loans, right now I pay an even $100 a month on my 1% interest loan. As for my 7% interest loan, I'm enrolled on a $25 a month autopay and I also had started paying $100 a month on that. A few weeks ago I decided to call them and see if there was any way that I could be making these payments go towards my initial principal instead of paying the interest. I was informed that that's not an option, but that I accrue about $160 each month interest, so anything I pay over that will go towards my principal. I read another article about paying back loans that said instead of making one big payment each month, split that into two and pay it every other week. Supposedly because some months have 5 weeks and such, you end up paying more without feeling like you're paying more. So now I pay $75 every other week on top of my autopay $25. And if I have any money left over in my account on the last day of the month, that goes directly towards paying my loans. Lol, I was just at my desk and looked up and realized that I forgot to mention something. In undergrad, I used this dry erase calendar to keep up with due dates for quizzes and assignments. In law school, I really haven't had any due dates, and especially not since my LRW class ended. A few months ago I realized that I had to come up with some reason to keep this calendar updated, so I started writing out what bills are due when. 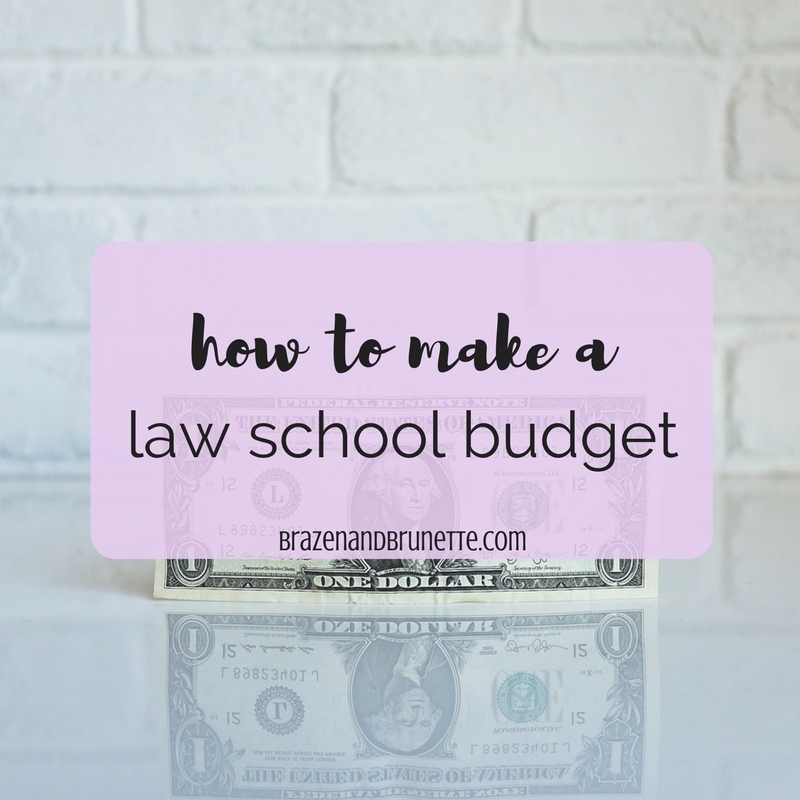 Admittedly, it is a little disheartening to look at a calendar and basically only see bills; but, it is handy to always know when money is going to magically disappear from my account and why, so I keep it around. Just another way to keep my spending in check and keep me on top of my financial responsibilities. Or if you want to make paying your bills a little less painful, you might try a fun bills calendar like what my sorority sister did! Also, I just found out about this app called Ibotta. Basically what I do is make a grocery list of what I need, and then go through this app to see what deals they have on what I've already decided I need (so I don't end up buying things just because it's on the app). Usually what happens is that it'll give you like a .50 rebate for using a sponsored brand over one you might have initially chosen. But it's not always brand specific and yesterday I got to use it on just the apples, bananas, and bread that I got. After you get home from grocery shopping, you open the app and find the store you were just at, then you find any items that they have that you just bought. Then it's as easy as taking a picture of the barcode on your food and confirming it by taking a picture of your receipt, and they'll give you money back. Right now I'm at about $11 that I've got back just from using this app. And if you use this code when you sign up, you'll get an automatic $10 extra on your first rebate!! I absolutely love your blog! I just found it last night and have been constantly reading it. 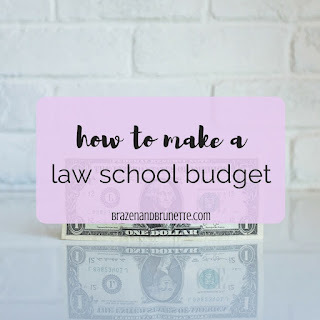 I'm going to undergrad this upcoming fall, and I plan on going to law school. Do you have any social media that readers can follow you on? Good luck in undergrad!! It really was an amazing four years for me and I'm sure it will be for you too!